Well Celiacs now have a sweet haven to pay homage to. 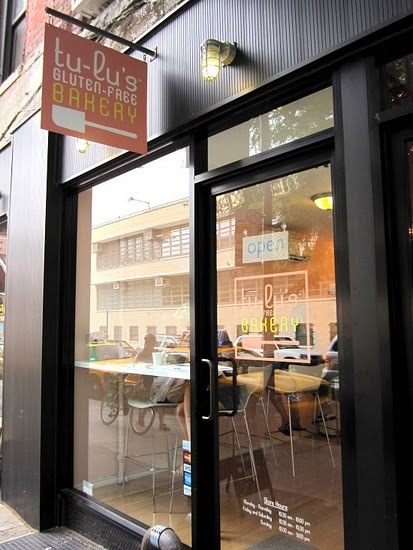 A bakery that is dedicated to celiacs is not an easy task. Whether you have a gluten intolerance or just want to try something new, Tu-Lu's is the place to go. They have a large variety of sweets, from cupcakes (mini too), to cookies, to brownies. If you are having a party, they can make a gluten free cake. At Tu-Lu's there is a Gluten Free and Vegan Brownie. It is beyond me how something without flour and eggs can still taste like ummm, a brownie. The mini cupcakes are the way to go, sample 3 for $3.50. Their peanut butter has a very natural taste, while the cherry is light and airy. How do you do that without white flour? Brownies these days are usually very sweet and it is often difficult to distinguish between the chocolate and the sugar. The chocolate brownies at Black Hound are very fudgy and need to be eaten cold. Why you ask? Well if you let them get to room temperature they become the consistency of brownie batter. Brownie batter is not a bad thing at all, but this is just something you should know. Not up for a brownie, try their truffles and mini cakes. It is a great addition to this area.